How can I precisely and quickly tie loops of line? The problem that I'm having is cutting the length consistently. I need to cut the lengths accurately to about +/-2.5mm. With tying loops on each end, it's very very difficult to get the length correct. The loops will be bearing about 30 lbs (13.6kg). I'll be tying roughly 52 lines with loops. What techniques are there to tie two loops in a line, such that the ends are an accurate distance apart? After a brief search using "diy knot tying tool," and mostly coming up with fly-fishing helpers, I think your best option would be to create a jig with pegs in the right locations. What are the right locations? That's a trial and error project. Picture a board of suitable length for your longest set of loops. Cut it in half and create a means to adjust the length over about a 30 cm distance. I'd use threaded rods and brackets along the side of the board, perhaps with wingnuts for ease of adjustment. At each end of the board, a series of pegs representing the loops in your selected knot around which you would wrap your lines. Your drawing does not show it, but for loops that will not collapse, a bowline knot is a good choice. The main portion of your line would wrap around two pegs spaced far enough apart to pass the line through, then continue to loop (1) around the peg at the far end of the board. Add a peg, or extend the far peg as needed to adjust the size of the loop. Once passed between the pegs (1) and wrapped back on itself, the pegs can be removed to tighten the knot. This will result in a consistent length of line being used for each knot, based on a reference point in the general area of the first two pegs. Excess line at the end of the knot can be cut, but over time, you'll develop a feeling for how much is needed. At the other end of the board, duplicate the pegs and the steps. The threaded rod in the middle allows you to adjust the end-to-end spacing to get the precise distance needed. If a knot other than a bowline is used, you may need more pegs. EDIT: In the case of 58 different lengths, you have a different task, but need only one board of pegs. Provide at the base of the board a marker or a clamp to which you will reference your line length. Initially, you will place your line at the marker, tie the knot as above and then remove and untie the knot. This will give you a reference distance to determine the length of line "consumed" by the knot, as well as a known distance from the end of loop to the marker. For example, you place a marked line at the reference point, tie the knot, remove the knot and measure the loop distance to the reference. It's 4 cm. and consumed 10 cm of line. If you need a total of 180, you know that you have to have 180 - 4 - 4 = 172 between the markers and 172 + 10 + 10 = 192 cm of line. Focus on the loops not the length of the string. Make a guide board or jig by putting two pins (or nails depending on the weight of the cord) in a board with their distance apart being the desired length of your looped string. Then tie your loops around the pins. Once you have your loops then you can trim the cord where it exits the knot. If you then untie the loops you have an idea of how long to make the cuts before the knots are tied. 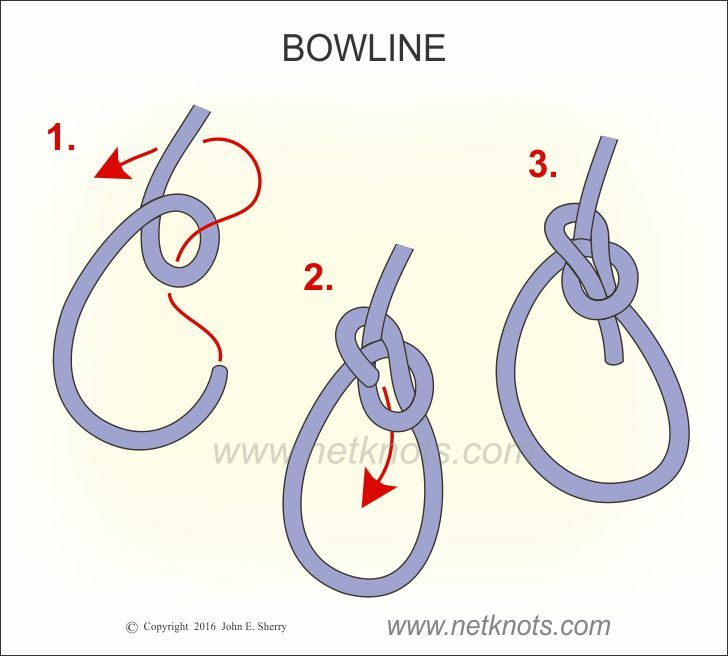 A good knot for making the loops might be the "bowline knot" since it will not slip once it is tied. Here is a diagram of it from the veritable bible of knot tying "Ashley's Book of Knots". This knot will not spill if tied properly, since you mentioned the load weight, but the cord you use has to be able to support the load and a string does not sound strong enough to support 30lbs. edit: I too missed the variable length part. Still, using pins would be the best way to control the length of your looped segments. Just reset the pins for each length. It is going to be easier than trying to tie each knot using the exact same amount of cord. Not the answer you're looking for? Browse other questions tagged knots or ask your own question. How do I evenly space my knots for my hanging craft project?